Debt & Bankruptcy Attorney Houston TX | Law Office of J. Thomas Black, P.C. 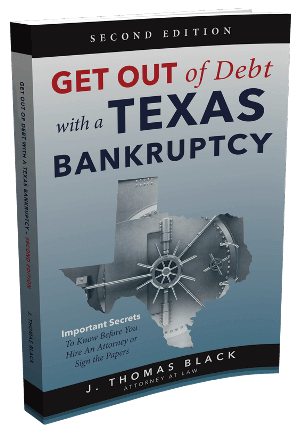 Every part of Mr. Black's Houston legal practice circles back to one primary goal: debt relief. Whether your troubles stem from foreclosure, student loans, credit cards or IRS-related issues, the Law Office of J. Thomas Black will help you get back on track. Congratulations! You have already started doing research about getting your debts under control, and that is a huge first step. The Law of Office of J. Thomas Black will take you from that first step forward toward financial freedom, or at least toward getting control of your debt problems. Mr. Black does not just “dabble” in bankruptcy law; it is his life’s work and his area of expertise. 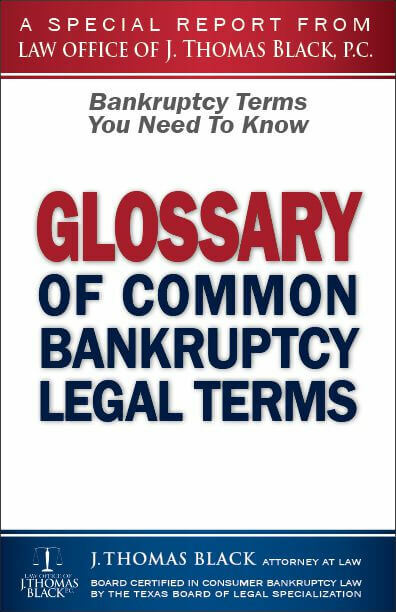 Along with his board certification, Mr. Black is an author and speaker on bankruptcy issues, and he is very active in the bankruptcy community. His extensive qualifications can be found on his biographical page. During your free first consultation, we will listen to your financial concerns and review your options with you. Once you choose an option and decide to move forward, Mr. Black and his staff will be there to put those plans into action and start proceedings that will get your life back on the right track. When it comes to credit card debt, lawsuits, repossession, foreclosure, student loan and IRS collection problems, you need competent and experienced legal help and advice. Contact Mr. Black’s office to arrange your free consultation with him. You can schedule it on this website, or by calling his Houston number 713-772-8037 or toll free at 888-707-1233. Does this sound like your life recently? You were raised to believe that you should own your own home, but after having some hard times, the mortgage company turns down your loan modification and you find yourself in danger of losing your house to foreclosure. You got two months behind on your car or truck payments, now the finance company wants all the money and you don’t have it. They are threatening to pick up the vehicle if you don’t pay it all now. You lose your job or overtime, and you have to use credit cards to make ends meet. Now they are “maxed out” and you have no way to pay your bills. You were always told about the benefits of getting an education, but now you are unemployed or underemployed and in default on your student loans. You can’t pay them back as fast as the debt collectors demand and they are calling constantly. As a last resort you've taken out payday loans, now you are drowning in debt and they call every day. Getting buried in debt is an all-too-common occurrence for many people in Texas. 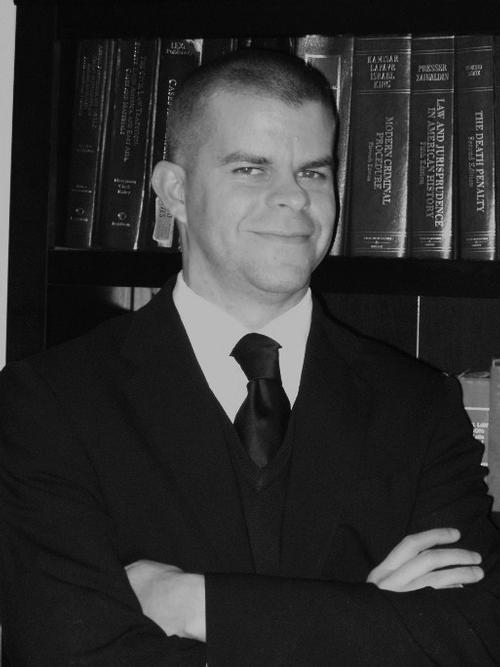 Attorney J. Thomas Black wants to help you dig yourself out. 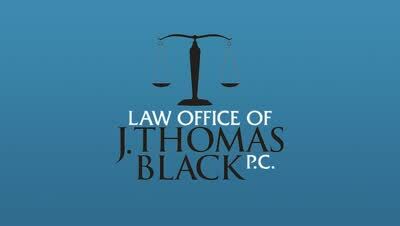 Mr. Black is Board Certified in Consumer Bankruptcy Law by the Texas Board of Legal Specialization. He will listen to you and show you the options that you have to choose from in your situation to either discharge, settle, or reorganize your debts. Getting your credit score to 720 or higher within 1-2 years after bankruptcy. The idea of filing for bankruptcy terrifies a lot of people because they think it means they are going to lose everything; the reality is quite the opposite. If you file Chapter 7 bankruptcy, bankruptcy law allows you to keep your exempt property, which—for most people facing the prospect of filing bankruptcy in Texas—is most or all of their property. You still must pay any valid liens on the property. With Chapter 13 bankruptcy, a debtor proposes a plan to repay creditors either partially or in full over a three- to five-year period. During that time, the debtor can make up overdue payments on her home, “modify” car and truck loans to make them more affordable, pay or “discharge” or cancel delinquent IRS debt and pay into the plan the equivalent value of any assets not covered by exemptions. Chapter 13 is best suited for someone with a regular source of income because it requires monthly or biweekly payments. Mr. Black will be able to let you know if this is a good choice for you and show you how a Chapter 13 plan would work in your particular circumstances during your first free consultation with him. Not yet ready for a consultation? Request some of Mr. Black’s free information. 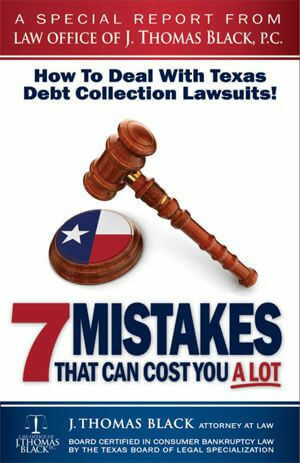 Free Special Report- How To Deal With Texas Debt Collection Lawsuits! If you've been sued and have a Texas debt collection lawsuit pending against you, you have a very limited amount of time before a "Default Judgment" may be rendered against you. Don't wait until it is too late. 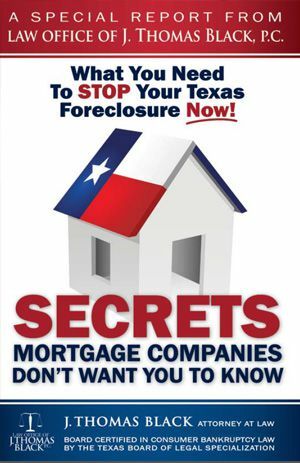 Free Special Report- What You Need to Stop Your Texas Foreclosure Now! Posted for foreclosure in Texas? You need to know your rights. Get our Special Report, and if you need help call our office for your free consultation. Request Your Free Book! 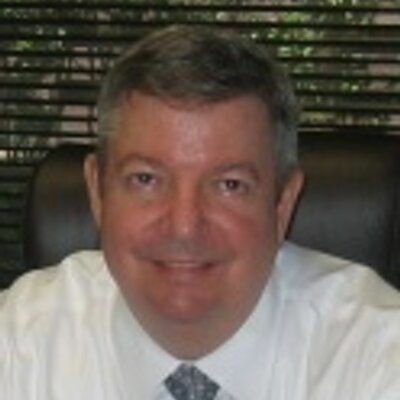 - "Get Out Of Debt With A Texas Bankruptcy"
Need a bankruptcy attorney in the Houston, Texas area? First, learn this important advice from attorney J. Thomas Black. Free Special Report: I.R.S. Problems? - 5 Ways to Get the I.R.S Off Your Back! 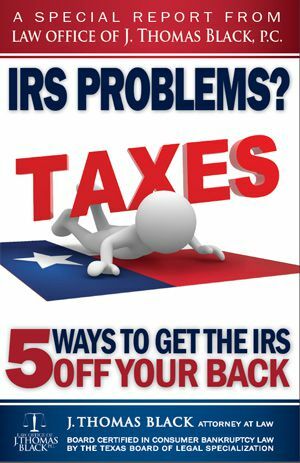 Do you have serious IRS problems? Are you facing a wage levy, a tax lien, or is a Revenue Officer contacting you about payment? You need this information. 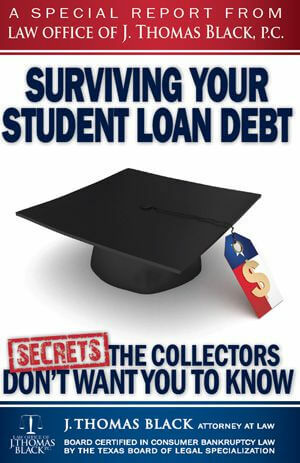 Free Special Report: Surviving Your Student Loan Debt - Secrets the Collectors Don't Want You To Know! If you have serious student loan problems, order our free Special Report! If you are in debt or facing bankruptcy in Houston, these videos offer you tips, tricks and advice to help you move forward. Welcome to the Law Offices of J. Thomas Black If you are facing issues of debt, foreclosure, repossession, lawsuits or judgments - you have come to the right place. How Filing Chapter 13 Can Stop Foreclosure & Save Your Home If you're facing foreclosure in Houston or any surrounding places like Katy, Sugar Land, Stafford or Cypress, call our office to make an appointment.